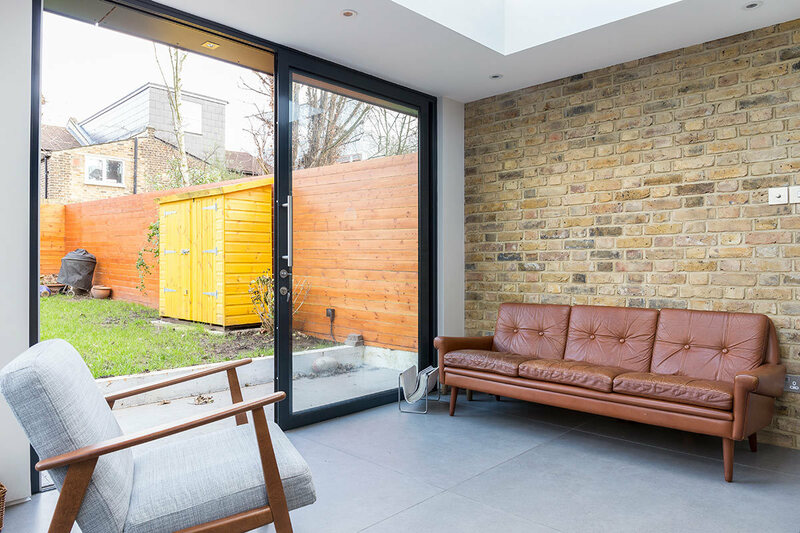 The owners of this semi-detached home were looking to utilise their generous garden space and extend their property out to not only the rear, but also to the side. Creating a kitchen, dining, and living space that’s perfect for big family meals, and entertaining friends. We had a lot to play with for this project. 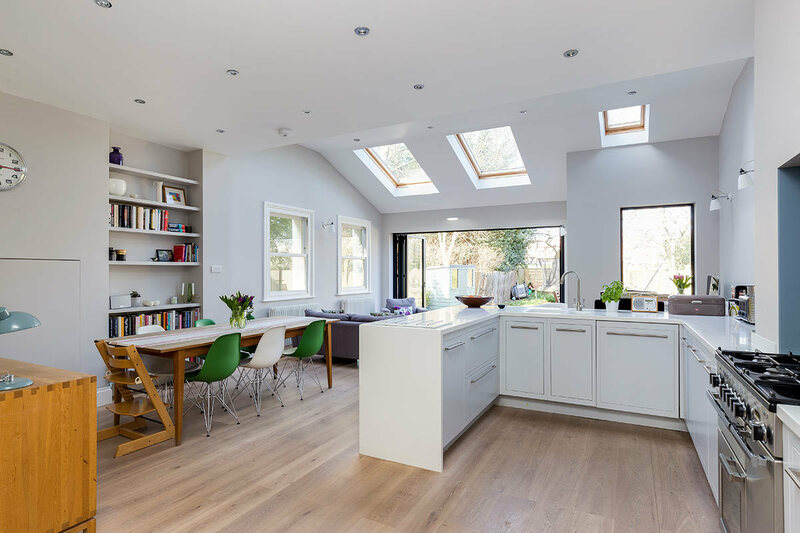 Being a semi-detached home, we were able to give their new space more height with a flat roof. 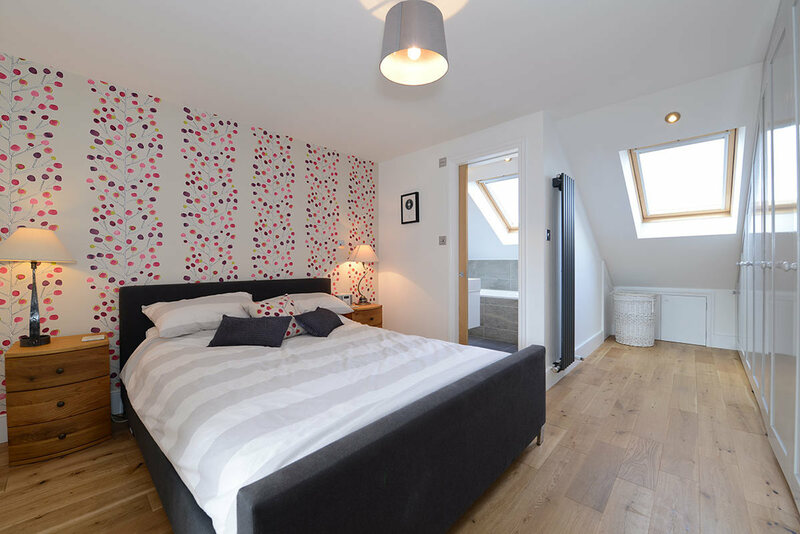 This property also benefited from dead alleyway space, perfect for a side extension. 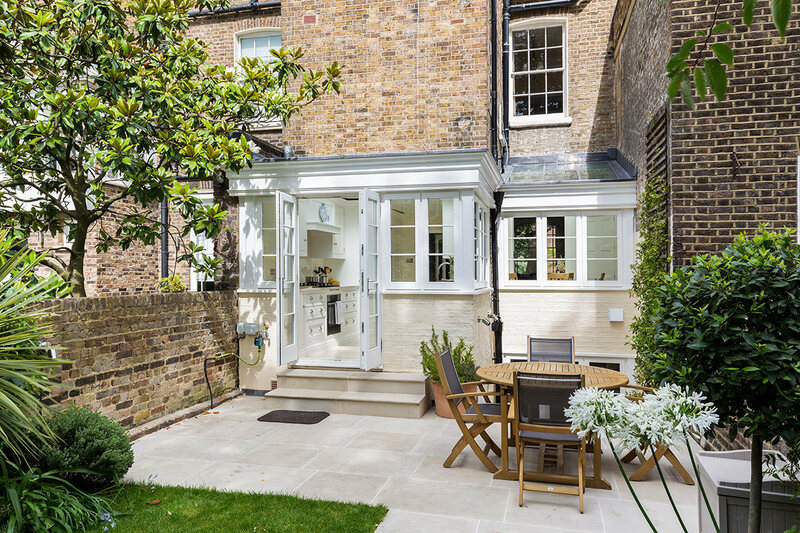 Many period properties have this under-used space, which is why the side extension is classic for these homes. However, that’s not to say this property wasn’t completely limitless. Because they were doing a rear and side extension, there was the possibility of combining them for what is known as a ‘wraparound’. These generate more space, but are more contentious when it comes to gaining planning permission. Because these clients opted for a full planning package, we were able to not only advise on a solution that would avoid these admin headaches, but also submitted the application on the homeowner’s behalf. The result of our planning know how? We created a stepped design, having the rear extend further out than the side. Not only did this allow us to circumvent any planning complaints, it also made for a visually striking structure, and allowed for some unique features - such as the glazed corner. 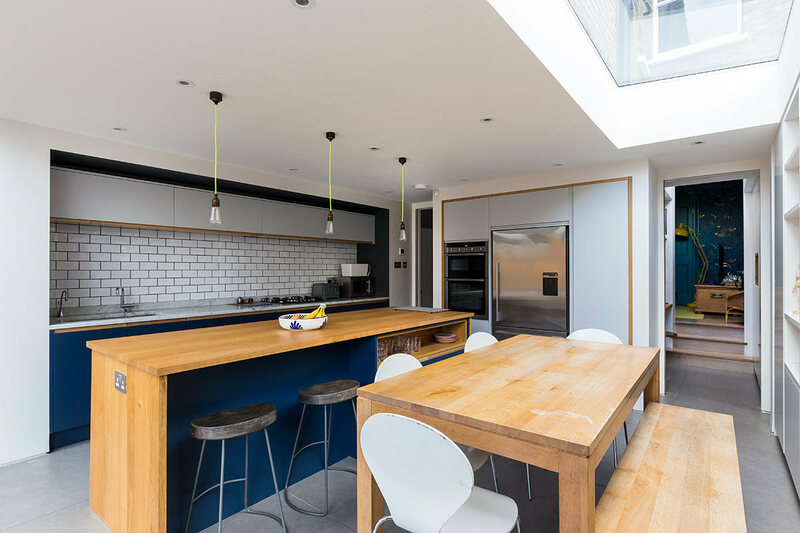 The visuals of this project were very important to these clients, who were keen to avoid their extension looking like a run of the mile box. 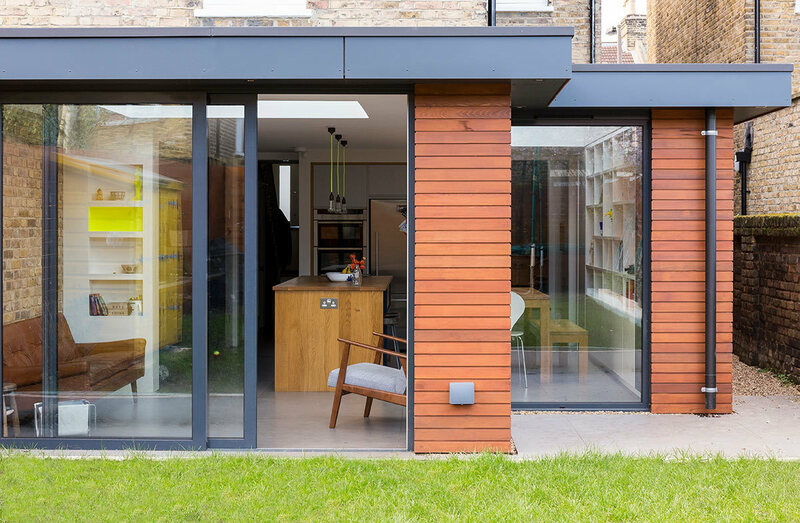 To help beautify their new build, we added cedar cladding to the exterior, allowing it to blend seamlessly with the cedar of their fence. We also created a contemporary finish with the contrasting black touches on the roof, doors, windows, and even drain pipes. For the windows, we wanted these to take centre stage, and allow this new space to feel connected to that generous outdoor space. 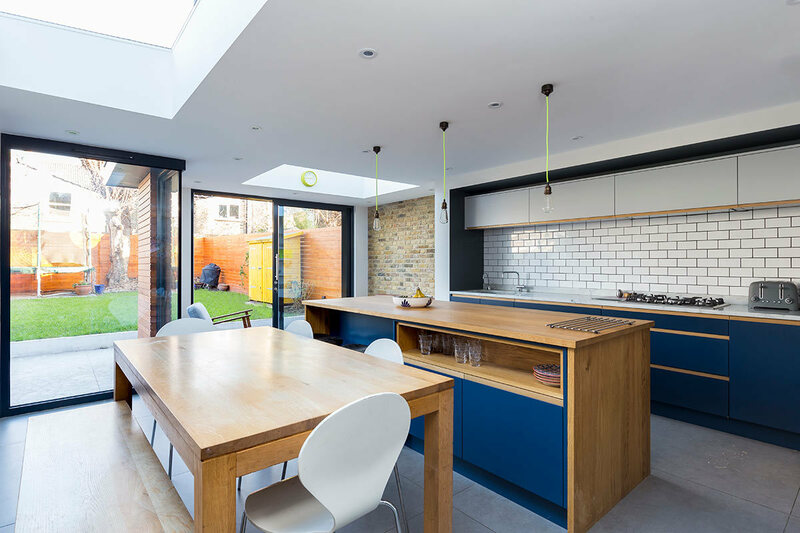 We added in window sections strategically so that anyone entering the kitchen would enjoy a beautiful sightline into the garden, also helped by the windows and door being floor to ceiling glazing. 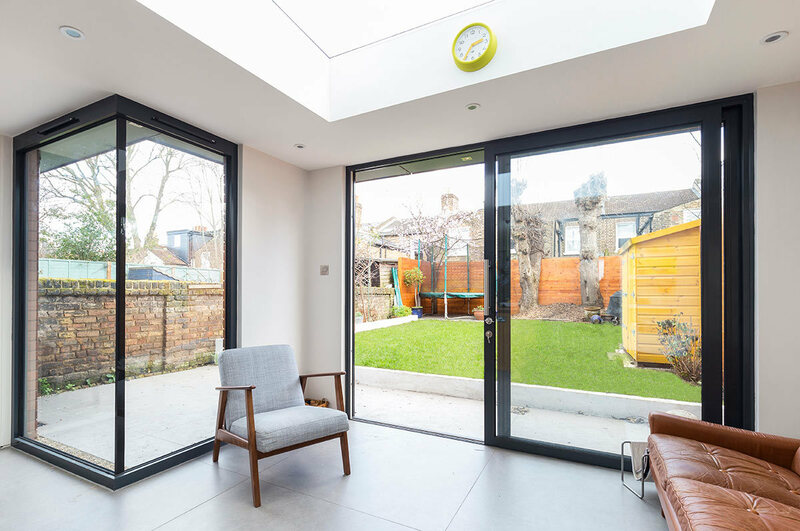 To bring in reams of natural light, large skylights were incorporated into the flat roof, with all these elements coming together to create a room that’s bright and feels open. Of course, at Resi we’re about a lot more than just a pretty face. To make this new space work for the family, we also incorporate plenty of storage solutions, such as hidden cupboards and appliance compartments. Meaning the family can use this space day or night, and not have to worry about clutter getting in the way of a relaxing evening meal. Overall, this design goes to show that you really can have it all: space, beauty, and that all important practicality.